Configure Eclipse or IntelliJ for debugging, attach it to a remote Java Web App on Azure and start stepping through code. As part of our continued efforts to enable Java developers to get things done in Eclipse and IntelliJ, we are announcing that Azure Toolkit for Eclipse and IntelliJ adds support for debugging Java Web Apps on Azure. In Eclipse, right click on a Web App project and select Debug As, then click on Azure Web App, and the debug configurations wizard will walk you through the process. Then, accept the default values set by the Toolkit and click on Debug. 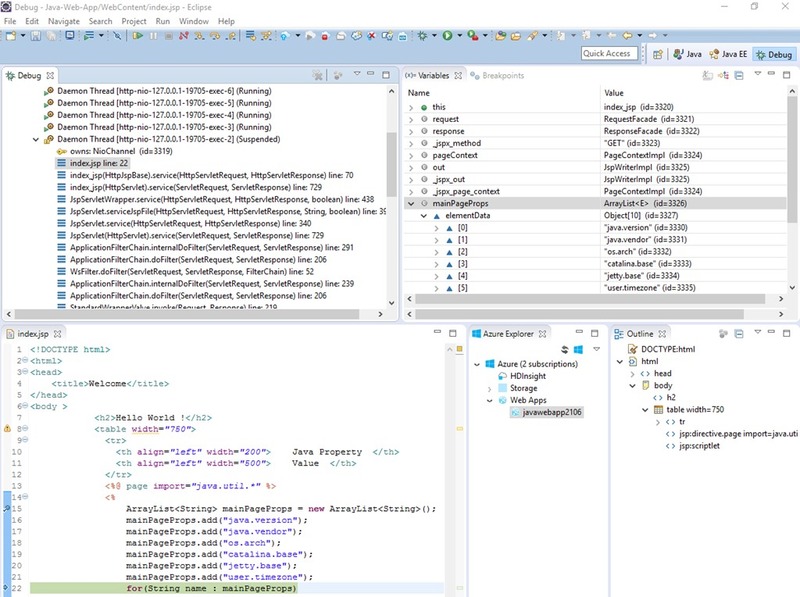 Afterwards, your IDE will go ahead and enable remote debugging on Azure and launch a command prompt or shell that will prepare necessary remote connection for debugging. Then, insert a break point in a JSP or servlet in the Web App, open the Java Web App URL in a browser, and the IDE will now enter into debug mode. Start stepping through code and inspecting variables, as you have always been. Interested in learning more? Read the documentation pages about remote debugging Java Web Apps on Azure in Eclipse or IntelliJ. 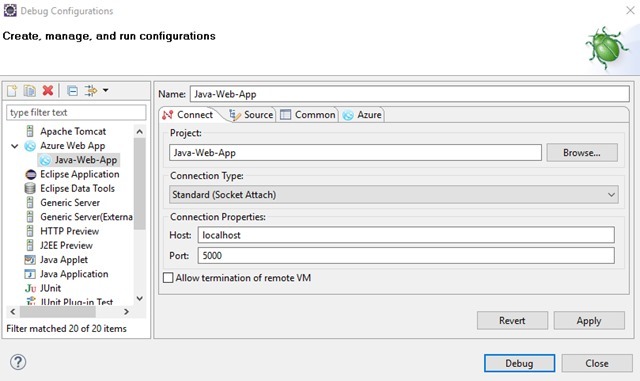 You can learn more about deploying Java Web Apps on Azure using Eclipse or IntelliJ. You can also find additional info about Java on Azure at http://azure.com/java. Please give it a try and let us know what you think on GitHub, Twitter, E-mail (Java at Microsoft dot com) or via comments below.